Gaming Tribe ★ Predatorial Behavior By Member ★ Creepy O_o - KABALYERO - PLAY, BLOG & EARN! 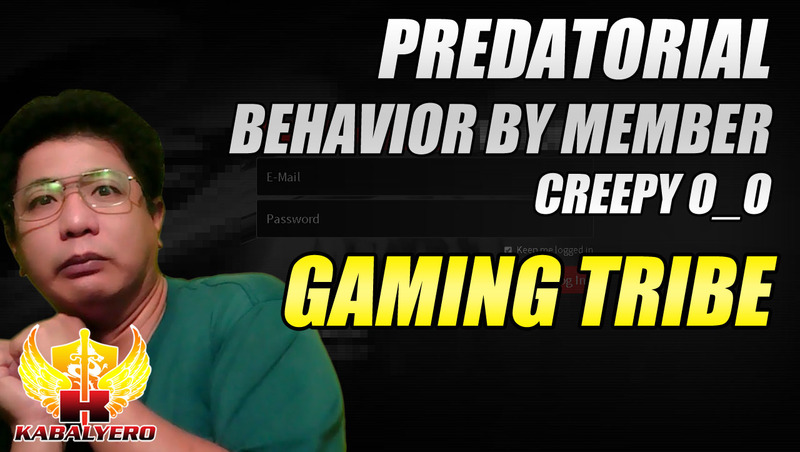 Gaming Tribe, predatorial behavior by a member was too creepy for me. A year and a half ago, I joined Gaming Tribe because they do a lot of free giveaways and I love joining free giveaways. I've never won any of their giveaways but I don't really care about that. Recently, I made an error of posting or sharing my latest giveaway on my Gaming Tribe account. A staff member deleted it and politely explained why. I thought that was the end of it but it wasn't. A day or two later, I received another message citing the same thing which was already resolved. The message also cited my sharing of my YouTube videos on my Gaming Tribe account. Honestly, there was no rule against sharing your own YouTube videos in your own Gaming Tribe account but, obviously, this person didn't like it. Surprisingly enough, I found the guy in my friends list. I've never asked anyone to be my friend in Gaming Tribe but I do accept all friend requests which means this guy asked to be my friend and I accepted. Here comes the creepy part, this guy didn't like what I was posting but he still asked to be my friend or he still friended me in Gaming Tribe. What was his purpose in doing that? Seriously, if I don't like what you're posting in any community (facebook, twitter, forums, youtube, etc.) I will not follow, friend or subscribe to you but this guy was different. He didn't like what I was posting yet he still friended me in Gaming Tribe and he, obviously, just did it to monitor my activities which, again, was very creepy and kinda predatorial in someways. At least, that's how I felt. Also, unlike the staff member who was very polite, the tone of this person's message was threatening. He was creepy, predatorial and threatening. In fact, it got too creepy for me that I instinctively deleted my Gaming Tribe account just to get away from this guy. That was a mistake, I should have just removed him from my friends list, because, now, I won't be able to join any future giveaways. Now, if you wish to receive updates when new blog posts are posted then follow @kabalyero in Twitter. You can also help me grow this blog by sharing this blog post to your friends.